4/2/10 (Friday): The setup still looks like a convective mess over Texas and Oklahoma, with mainly a hail and damaging wind threat. But with some luck, a clear slot and good daytime heating, some supercells may be possible across central/north Texas. Although it’s not a good setup, generally speaking. 4/5/10 (Monday): Finally, I see a light at the end of the tunnel. Models show the last shortwave in this pattern ejecting into the Plains early next week. According to the GFS (operational and ensemble), a deep surface low will form over the central high plains on Monday with a strong 850mb jet out of the south. This looks very interesting. It has the potential to be a classic setup for supercells, some tornadic, firing off the dryline from Texas to Nebraska. We’ll see how the models work out the details in terms of timing, but this day has my attention. Beyond 4/7/10: With the MJO weakening and the El Nino pattern taking hold again, the favorable pattern for chase setups across the Plains will end. We will have to rely on climo for chase setups as we move into mid April, but the synoptic pattern looks less than ideal. Friday, April 2 is not looking very impressive to say the least. Models continue to show mostly southerly 850mb and 500 mb winds across Texas and Oklahoma. This will cause storms that do manage to form off the dryline Friday afternoon to move parallel to it, which is not conducive for isolated supercells or tornadoes. Before any of that, however, we have to deal with the first big issue — low level cloud cover and drizzle. Intense warm air advection will be in place early Friday morning as a result of a 50 knot 850mb southerly jet. This will help transport low level moisture over very wet Texas soil. That will cause a thick low level cloud deck to form accompanied likely by drizzle which may linger into the afternoon. For the first half of the day, instability will be quite low, causing much of Texas and Oklahoma to be covered in clouds and drizzle. As the intense upper trough ejects into western/central Texas Friday afternoon, it will cause all kinds of convective bands to develop. Some will develop well ahead of the dryline across central/northern Texas from warm air advection, and some may develop along the dryline, extending into central Texas and Oklahoma in the evening. But even in the absence of solar radiation, modest CAPE will develop. Based on the latest models, deep layer shear will be mostly supportive of linear storms moving rapidly to the north. Should a clear slot develop in the afternoon across central or western north Texas, it would allow for much greater instability to form, and increase the potential for severe storms. Overall the setup looks like a big mess right now. But given the 50 knot 850mb southerly jet, a 70 knot 500mb jet max, and the ‘hope’ for a clear slot in the afternoon, this setup shouldn’t be completely ignored. In order for this setup to be more than just a big convective mess, the wind shear needs to improve (more southwesterly 500mb winds or more backed 850mb winds) and the low level cloud deck needs to find a way to mix out by midday so more instability can develop. Next potential setup April 6/7? Models are showing another intense shortwave ejecting into the Plains next Tue/Wed (April 6/7). There is no need to discuss the details now, but that is the next ‘setup’ to keep your eyes on across the southern Plains. After that it appears the MJO may fade again. If so the El Nino pattern will become the main driver and, unfortunately, bring back a less than ideal pattern for severe storm setups across the Plains as we head into mid April. Friday, April 2 continues to look interesting for potential severe storms. But nothing about the setup looks great yet. According to both the European and GFS operational models, west Texas to western north Texas would be the area for severe storms/supercells to occur Friday afternoon. The setup would feature a thick, low level cloud deck and drizzle for the first half of the day. But, a pronounced dryline mixing east across west Texas would provide an opportunity for the cloud cover to erode. Thus, enough instability may develop late in the afternoon across west Texas ahead of the dryline to support severe storms. Although, how quickly the low level clouds erodes (if at all) is a major concern. According to the GFS, another major concern will be storm motion. Given the deep layer shear profile suggested by the GFS, storms would form off the dryline and move quickly to the north-northeast. This motion would promote storms moving nearly parallel to the dryline and is not very conducive for sustained sueprcells and tornadoes. However, the early stages of the storm’s life would provide some tornado potential given a strong southeasterly 850 mb jet. There is still plenty of time for the details to change as the models continue to get a better handle on this system. But, Friday remains something to keep an eye on across Texas. Next Friday through Sunday (April 2 – 4) continues to look interesting. Friday the 2nd looks the most interesting right now, considering it will probably be the first day when enough quality low level moisture will be in place across western north Texas, the Texas panhandle, and parts of western Oklahoma to support severe storms. Also, the ensembles show a deep trough approaching the southern plains that day. So depending on how quickly that trough ejects eastward and how quickly moisture can return, Friday may end up being the first decent chase day of a series of chase days. I do expect low level cloud cover issues along with drizzle/light rain across Texas next Friday. This is because sea surface temperatures in the Gulf remain quite cool (2 to 3 degrees below normal, actually). After two or three days of moisture advection from the warm Caribbean, across the very cool Gulf waters and over the very wet Texas soil, a thick low level cloud deck along with drizzle will develop across the southern plains. But the approaching strong upper trough should allow for a pronounced dryline to develop, which would be the area to look for severe storms. Hopefully enough dry air will mix near the dryline to erode most of the cloud cover by late in the afternoon. The ensembles/longer range models are coming into good agreement with the MJO, GWO and other global signals. For that reason it’s becoming evident that there will be chase setups during the first week of April across the Plains. In fact, based on the ensembles, April 2-4 is becoming very interesting concerning severe storm potential. But how quickly quality moisture can return north remains the biggest concern. Based on what I am seeing, there should be at least one good setup with quality low level moisture available across the southern Plains in the April 2-4 period. However, the entire first week of April will feature a weather pattern favorable for severe storm setups. I’ve been following the progression of the MJO over the last week or so. Based on satellite trends and consistent MJO model forecasts it’s becoming more clear that the increasing convection across the Indian Ocean into the Indonesia region (Maritime Continent) is the MJO moving east. Furthermore, based on the latest Ensemble forecasts across North America for the next 15 days, it’s becoming evident the MJO will play a key role in the weather pattern as we head into early April. This is significant since, as of late, El Nino and the Arctic Oscillation have been the more significant factors. As the MJO reaches phase 4 (Indonesia region) in late March/very early April, deep troughs should slam into the west coast of the U.S. There should be at least a five day period with a mean trough centered over the southwestern U.S. and a mean ridge over the East. Furthermore, the GWO is in sync with the MJO at this time, responding to low Global Atmospheric Angular Momentum. This will enhance the deep troughing over the southwestern U.S. and help to provide a bit of ridging over the Southeastern U.S. –although the center of the ridge will be over the Great Lakes/Northeast. For several days this eastern ridge will hopefully provide time for low level moisture from the Gulf to return northward into the southern Plains. With all that being said, the synoptic scale weather pattern will become much more favorable for severe storm/chase setups across the southern to central Plains April 1 – 7. The one key negative factor continues to be a source for quality low level moisture in the Gulf of Mexico. For this reason, Texas and Oklahoma may again be the hot spots, but we’ll see how the Gulf recovers and how quickly moisture can return. Soil moisture values remain very high over Texas, so that’s a good thing. 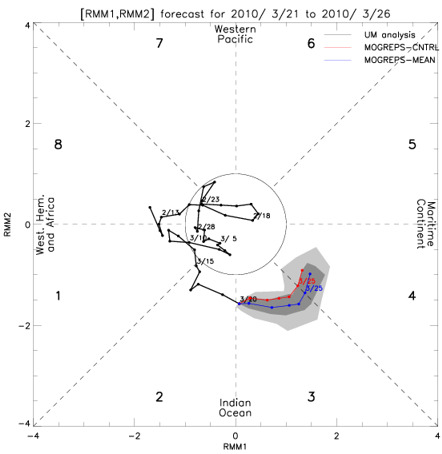 Below is the latest UKMET MJO model forecast. It brings the MJO into phase 4 by March 25, but it’s unclear exactly how quickly the atmospheric response will impact the U.S.
Below is the 12z March 21 GFS Ensemble forecast for April 1. Notice how it shows a deep trough over the southwestern U.S. ejecting east into the Plains on April 1. This type of pattern should continue for several more days into April, providing potential chase setups across the Plains. That is, assuming enough quality low level moisture can come into play over Texas and Oklahoma. With no active chase setups to talk about, I thought it would be interesting to discuss the steps chasers must take days or even weeks in advance of storm chasing setups, and what it takes to actually chase storms. Some readers are active storm chasers, some are new to the chasing community, but most probably are not familiar with everything that’s actually involved in preparing for a day of storm chasing much less actually storm chasing. So without getting too in depth, let’s take a look at the most important things involved. Probably the most obvious thing to be aware of is the weather pattern. After all, if you don’t have a clue when a severe weather setup might occur, how could you possibly be prepared when one pops up? Most storm chasing setups occur within a three or four month window, from the early/mid spring on into the early summer (mid/late March through early July) across the Great Plains of the U.S. So storm chasers are on high alert – so to speak – during that time of year. Now that chasers know the general time of year to be looking for chase setups, they need to have a week or a few days notice on upcoming chase events. For that reason most chasers can forecast the weather to some extent. After all, the ability to forecast truly is the most important aspect of storm chasing. Unfortunately weather forecasting, especially tornado forecasting, is extremely difficult and requires a great deal of knowledge of atmospheric science, or meteorology. Even professional meteorologists have difficulty forecasting tornadoes days and sometimes even hours in advance. So for a storm chaser who is not trained in the field of meteorology, forecasting when and where a decent chase setup will occur proves to be quite challenging. Some of the most experienced storm chasers are either meteorologists who chase as a hobby or for research purposes. Some have been storm chasing for so long they have become self taught weather forecasters , so to speak. Whatever the case, if you are a storm chaser looking for chase setups in the spring, you monitor computer models daily. Unfortunately these models can be quite unreliable as little as three to four days into the future. That’s when the knowledge and expertise of a degreed meteorologist comes in handy. These storm chasers can make their own chase forecasts and therefore are going to have far more success intercepting tornadoes than other chasers who lack forecasting expertise. Now we’ve established that storm chasers have to be able to monitor the weather pattern themselves, monitoring computer models and interpreting things accordingly. From this monitoring ,as well as consulting forecasts provided by the Storm Prediction Center, storm chasers have a general idea of where tornadoes might form a few days in advance. The next step is all about location and driving. Chase setups can occur anywhere from Texas to the Dakotas into parts of the Midwest. Even though the Storm Prediction Center’s forecast and the computer models will give chasers a general location for where tornadoes are possible, the forecasts and computer models are fraught with error. The chasers must plan to be in a certain location in the morning or by midday so they are prepared if they need to drive much further than expected to intercept storms. This preparation isn’t as easy as it may seem at first glance. Many times chasers are forced to leave their home (or hotel room) late at night, driving a great distance into the first part of the following day just to be in position for the day’s chase. Most of the time sleeping is a low priority and sleep deprivation is inevitable. It’s always a good idea to carry energy drinks and quick sources of protein and vitamins. Eating is never a priority when you are forced to drive all through the night and day to make it in time for storm initiation that afternoon. In that case, drive-through fast food becomes your meal source–so keep your vehicle stocked with quick options. The next issue regarding preparation is access to weather data. Once you are on the road, you need to have access to the latest computer models, satellite/radar images as well as surface and upper air charts. Without access to this kind of information, a chaser will continue driving to his/her target region without knowing that an important factor in the forecast has changed. Now the chaser could be driving away from the best area for tornadoes without knowing it. Basically, access to constantly updated weather data is essential on a storm chase. With today’s technology, getting access to weather data while on the road is getting easier and more efficient. Most chasers can download radar images on their phones while in the car. An increasingly large amount of people have internet access on their laptops enroute as well. In today’s chasing world, data is streaming constantly and this proves to be very helpful in intercepting tornadoes once tornadic storms have formed. But this data is only useful if the chaser is already in the general area where tornadoes will occur. And once again the ability to be in the general region where tornadoes will form consistently, chase after chase, requires a high level of forecasting skill and experience. Even the best chaser will experience a ‘bust’…even the most seasoned and apt meteorologist. A chaser also needs to have detailed maps. Personally I prefer topographic state maps simply because they are easy to use and provide even the smallest roads in a state. But again, in today’s technologically advanced chasing world most chasers use GPS on their laptop or have GPS installed in their car. I say to each their own, but a paper map will never malfunction. Camera equipment including a still SLR camera, a high definition video camera, tripod, laptop, cell phone, car charger and batteries are usually required on a storm chase. Some chasers also have ham radios and other communication devises requiring tons of antennas to be attached to the side or roof of their vehicle. But that’s unnecessary and all you really need is a standard radio and maybe a hand held weather radio. The rest will cause your vehicle to receive much more attention than normal and might attract law enforcement. Be wary and cognizant of local law enforcement and uphold speed limits– being stopped by a police officer will take valuable minutes away from your chasing process. You need to plan ahead financially for stormchasing– it all adds up fast. Gas money, food, and unexpected car repair are just a few of the many expenses that will pop up during your journey. For those who chase with a partner or in groups this isn’t a big problem. But for those who chase solo this is a significant financial requirement. In a typical chase season storm chasers can drive thousands, sometimes tens of thousands of miles within a month or two period. So having the funds to pay for gas is crucial and in the past has caused some storm chasers to sit out on low-risk tornado days. Being low on money towards the end of a chase season has caused chasers to miss tornadoes even when they are actively looking for chase setups. Understand that you need to be able to endure lots and lots of pain, stress, boredom, sleep deprivation, and disappointment. With all the money, preparation, time and work involved with storm chasing it doesn’t usually result in seeing a big tornado up close. Most of the time you don’t see anything, or at best you catch a nice sunset. Sometimes not a single storm develops and sometimes too many storms form and no tornadoes occur. All chasers have been in a situation where they follow a storm with a tornado warning that actually never produces a tornado, yet the storm fifty miles to the south does produce. Storm chasing is extremely frustrating and taxing on you and your car, and if you don’t have a strong desire to see an amazing supercell thunderstorm and possibly a tornado, then you probably are not willing to go through all the stress and pain of storm chasing. However, all of this planning and exhaustion is worth it upon experiencing the raw power and beauty of a tornado. As of late cold fronts have been plowing through the Gulf of Mexico frequently. Now and as we head further into March sea surface temperatures will play a key role in how long it will take for surface dewpoints to return/recover over the southern Plains. 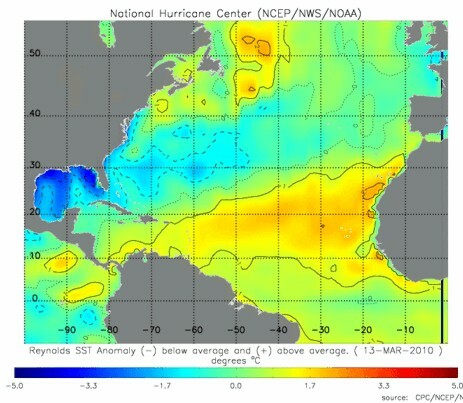 The image above shows the sea surface temperature anomalies for March 13, 2010. Notice the 2-3 degrees C below normal area covering the entire Gulf of Mexico. This represents very cool water temperatures relative to normal. At least for the next couple weeks this will make it difficult for storm systems to have enough time to advect enough low level moisture north to support severe thunderstorm/tornado setups across the southern Plains. What I think will be more likely is more closed upper low or cold core type setups. With a moderate El Nino still in place the active southern branch of the jet stream should continue in some form. This (hopefully) will continue to bring strong upper lows across the southern Plains from time to time. And even though low level moisture will be tough to come by soil moisture values over the southern Plains remains quite high. This will help to keep moisture from mixing out as it advects northward across Texas. Besides, cold core setups don’t require the same amount of deep, low level moisture as classic warm sector setups. So even though the chasing season seemed to start off with a bang in Oklahoma on March 8th, conditions are not exactly looking spectacular at the moment, but at least we can hope for more cold core events. The latest major tornado witnessed by several chasers over western Oklahoma near the town of Hammon brought me to this topic. I started thinking to myself, “Since when are cold core tornadic supercell setups so widely known?” The answer is not until recently. Just three or four years ago even the SPC would miss these types of setups from time to time. Most storm chasers with the exception of the most experienced at that time were not aware of the dynamics involved. But times have changed and continue to move in a new direction. On Monday, March 8 a significant tornado touched down in western Oklahoma north of Elk City. According to unofficial reports the tornado was on the ground for about 25 minutes and caused significant damage to homes in the town of Hammon, Oklahoma. From the damage photos I’ve seen this tornado was probably an EF2, but I don’t know what the official damage survey results were. Back the topic at hand, this tornado (and parent supercell) was formed from a cold core setup. The whole reason I’m bringing this up is because a different set of dynamics have to come together compared to typical warm sector tornado setups to produce a cold core tornado. Cold core setups are much more difficult to forecast and they usually occur in much smaller regions in a much shorter window of time than warm sector setups. It’s also much easier for one important factor or ingredient to NOT come together during cold core setups, causing a busted forecast. So in the last few years knowledge of these setups has spread deeper into the chasing community as shown by the number of storm chasers – especially the younger ones – witnessing the Hammon tornado. Now I don’t want to go as far as saying everybody is now on top of cold core setups. The Hammon torando was only about 30 miles north of I-40, and I’m sure plenty of chasers chose western Oklahoma as their target considering the SPC had their 2% tornado risk there. Thus, some – but not all – chasers were probably on I-40 when the storm which produced the Hammon tornado become tornado warned. Some chasers were probably able to book it north and catch the tornado. Some chasers probably made a good forecast and were rewarded. Go back a few years and there may have been one or two chasers on this tornado, not a dozen. It’s clear that more chasers are learning in some aspects how to forecast cold core setups. Technology is also playing a role. In today’s chasing world if you don’t have radar access at least on your phone then you are living in a cave. When I started chasing back in 1999/2000 I didn’t even have a cell phone to call a nowcaster for radar information. I relied on my morning forecast, internet data once or twice during the day in town libraries, a weather radio, and most importantly my eyes and ears. Today most chasers have radar data streaming out of every electronic gadget you can think of from a cell phone to a laptop or other devices. The amount of real-time weather data they have is simply astounding. Even today I don’t use GPS, I still use topographic paper maps by the state. I just trust them more. If I had GPS I’d be afraid of either an electronic problem in the heat of a chase or it would just confuse me. Either way you can’t go wrong rocking it old school with a paper map. 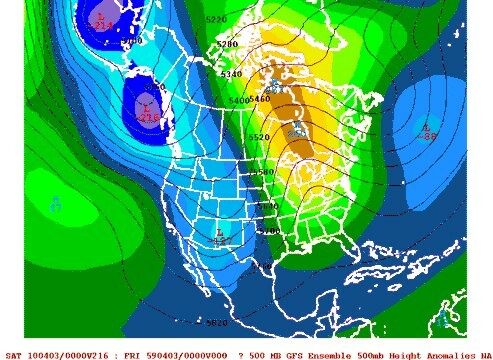 In the end it’s pretty obvious that the knowledge of cold core setups continues to spread and technology is helping, both in educating chasers and providing them with the data necessary to get to the storm faster. It is indeed looking like a possible repeat of Monday with more cold core supercells producing tornadoes. But this time the effected areas will be central/north central Oklahoma into south central Kansas this afternoon. The intense upper level low is being forecast by the latest models to track through that region. The extremely cold 500mb temperatures will aid in just enough CAPE (despite mid/upper 40s dewpoints) to support cold core supercells and probably at least one tornado, if not a few. Should dewpoints closer to the lower 50s become realized then I’d be concerned about several tornadoes occurring. But even dewpoints in the lower to mid 40s will support cold core supercells and some funnels. At least two tornadoes (one long tracked, causing structural damage) touched down in western Oklahoma yesterday, but the activity for the week isn’t over yet. Computer models are showing the next strong upper low tracking through Oklahoma and southern Kansas tomorrow (Wednesday). Similar ingredients to yesterday’s event will be in place across northern Oklahoma/southern Kansas including cold temperatures aloft, intense lift and strong wind shear. It will come down to the exact timing of the upper low and just how much low level moisture is able to rap around the system. But the potential for more cold core tornadoes is evident. Another region to watch is eastern Oklahoma, but that region is less favorable fore tornadoes. All the dynamic forcing will be further northwest with the upper low. However instability and wind shear will be support of severe storms and possibly supercells depending on how much the 850 mb winds back during the day. Monday, 8 March: 10:oo a.m. This setup, while still not impressive, is a bit more interesting this morning. We are still dealing with a close upper low system that would normally be most favorable for cold core supercells over the Oklahoma and Texas panhandles. That setup still looks alive and probably holds the best opportunity to see a decent, chasesable storm today. The other area is over central Texas in the warm sector ahead of the dryline. Despite the shortwave being a close low, deep layer shear is more than supportive for supercells since the 500mb winds are so veered (straight out of the southwest) and quite strong (60-65 knots). This is on top of 850mb flow out of the south-southwest around 30 knots. But the main problem – which has been stated here for about a week – is low level cloud cover. The good news is the cirrus deck is already moving out of central Texas, so all we need is daytime heating to overcome the low and mid level warm air advection. And maybe enough mixing will occur east of the dryline to allow for some sunshine to break through the clouds west and southwest of Dallas to build enough CAPE to support severe storms. The evolution of the ‘clearing’ this afternoon across western to central Texas should be interesting and will determine whether or not supercells can develop. If they do develop low level shear is supportive of an isolated tornado or two with dewpoints in the upper 50s to near 60 and surface temperatures in the upper 60s to 70s. Otherwise the cloud cover may simply remain largely in place, keeping CAPE values quite low. This would result in mostly elevated convection and basically a big mess. 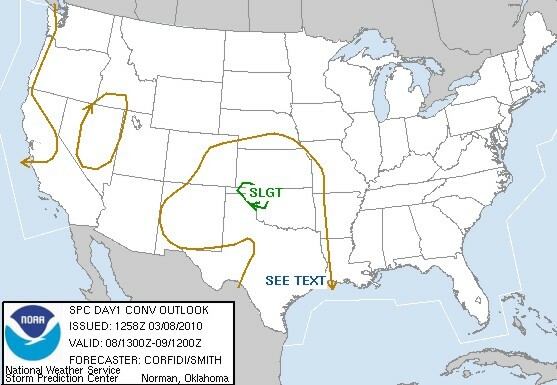 The SPC only has a slight risk for the cold core setup in the TX/OK panhandles, with just a See Text region over Texas. Like I said before this setup isn’t great, in fact it’s pretty marginal. But if conditions come together just right things could get interesting later this afternoon and early into the evening. Friday, 5 March: 10:00 a.m.
Mostly a messy severe potential for Monday across Texas and Oklahoma continues…. If anyone is planning on chasing feel free to leave a comment. I’d love to hear your thoughts/plans. I’m happy to see the GFS/European models have trended in the way I expected yesterday. 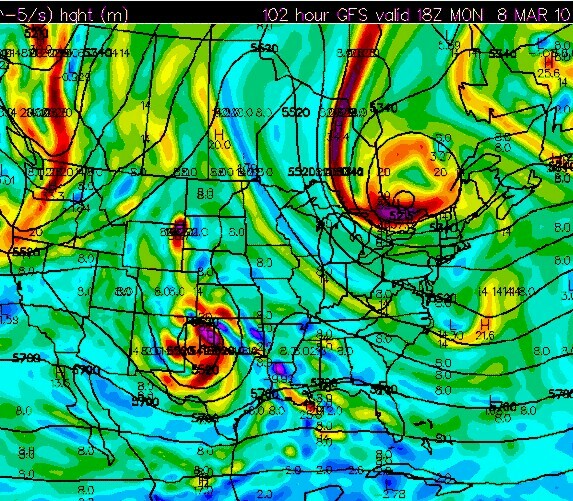 The GFS is lower to eject the shortwave into the southern Plains on Monday. Plus the European sped up the system a bit and now both models bring the upper low to the Texas panhandle by 00z Tue 9 March (Monday evening). Details with the wave are still subject to change since, again, we are dealing with a closed upper low over the Pacific. But at least now we can have confidence in this wave impacting the southern Plains on Monday. With a surface low expected to deepen during the day over the Texas panhandle expect a dryline (albeit difuse) to mix eastward throughout the day from west Texas into central and western north Texas by the evening. Moisture is going to be an issue, with the GFS bringing lower to possibly mid 50s dewpoints to the I-20 corridor and lower 50s to the Red River and southern Oklahoma. But despite that lapse rates will be quite steep, especially later in the afternoon/evening as the upper low moves in and 500mb temperatures drop to -18/-20C. If the low level cloud deck can be mixed out by sunshine 500-1000 j/kg of CAPE is possible across central to western north Texas. One good thing I can say is the GFS does show a clear slot in the upper levels clearing our the high level clouds by midday across western and central Texas. But the model doesn’t actually show the low level cloud deck mixing out. But this will be a key player in the forecast across the warm sector. Should that cloud deck mix out, the 500-1000 CAPE could be realized and support the instability necessary for severe thunderstorms, some possibly supercells. But it’s going to be an uphill battle with intense warm advection over central Texas. Although maybe enough dry air will mix in just east of the dryline and bring a small clear slot….we’ll see. The 850 to 500mb directional shear looks quite poor. And there will be a lot of forcing by the afternoon and evening from intense vorticity advection. So I expect mostly linear storms/bow echoes across the warm sector in Texas initially. As storms move rapidly north-northeast or northeast a squall line should develop. It really just looks like a messy setup still across Texas unless some things change. Across central Oklahoma there should be a lot of rain with all the warm advection. The cold core setup looks further west over the Texas or Oklahoma panhandles, if such a setup exists. I’m personally not impressed with it right now, but things could certainly change. Thursday, 4 March: 2:00 p.m.
Well the focus for the first potentially decent chase setup has shifted from Sunday to Monday across the southern Plains. Computer models insist that a shortwave that is currently over the eastern Pacific will be slower than previously depicted to eject into the desert southwest and then southern Plains Sunday into Monday. Below is the latest (12z March 4) GFS run, showing the 500mb shortwave over Texas and Oklahoma midday Monday. This scenario would present a warm sector severe thunderstorm threat across much of central and eastern Texas. A strong 850mb jet out of the south underneath a very strong southwesterly 500mb jet will provide great shear for supercells. But the problem – like Sunday – will be extensive low level cloud cover. If a clear slot can develop in the afternoon then things could get interesting in Texas, but right now that setup looks messy. Don’t worry – these details will probably change, so stay tuned. Another possibility is for a cold core setup of low topped supercells and possibly even tornadoes across western Oklahoma. This type of setup is much more difficult to pin down this far in advance, but the potential is there. I do want to point out that the slower European solution has been leading the way with this shortwave. The latest 12z March 4 European remains slower than the GFS, bringing the closed 500mb low to the northwestern Texas panhandle by 00z Tuesday, March 9 (Monday evening). So how slowly this shortwave ejects eastward remains an issue in the models. This usually happens when a closed upper low is involved coming out of the eastern Pacific. I think models will continue to have problems with the timing until the system is actually measured with upper air data in California (Sunday morning). Until then expect continued model disagreement. So I would expect the GFS to continue trending slower with the eastward ejection of this shortwave, but how much more is the question. At some point the European will have to speed it up a bit as well.